As mentioned in an earlier post, we had parked a short distance from the Three Sisters parking lot as it was full. As warm-up, we went for an easy hiking trail into the plains, just to get a sense of what it was like. We walked back and felt that we could challenge ourselves a bit more. So we followed a trail which led us into the mountains, specifically along a trail which led us towards the ridge between the Three Sisters. 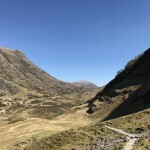 To be honest I didn’t know which trail that was but after some research, it seems that we have embarked on a Three Sisters Hiking Trail in Glencoe near Gearr Aonach. 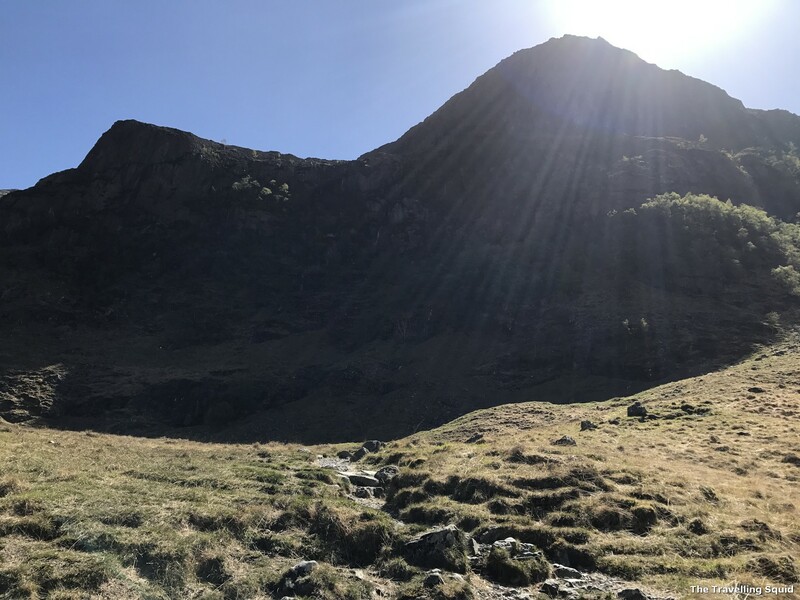 The Three Sisters – to your left, on the east is Beinn Fhada, the middle is Gearr Aonach and the one on the far most right is Aonach Dubh (on the west). 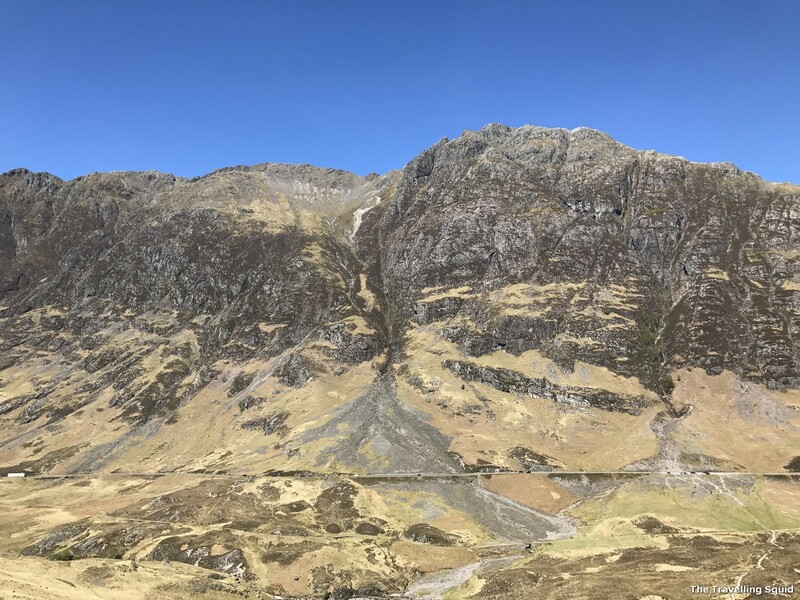 If you’re wondering what is Gearr Aonach, it’s the middle peak of the Three Sisters, which forms part of the mountain, Bidean nam Bian. 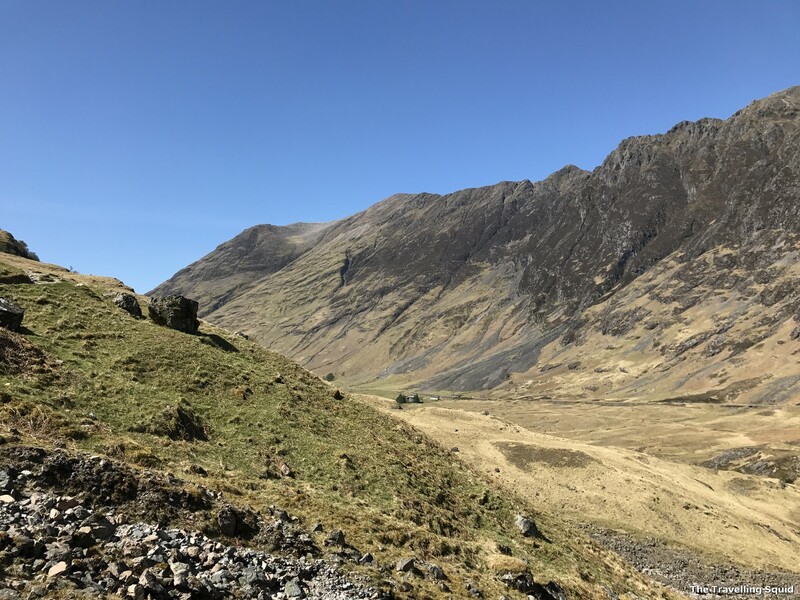 According to Wikipedia, Bidean nam Bian is the highest point in the county of Argyll. 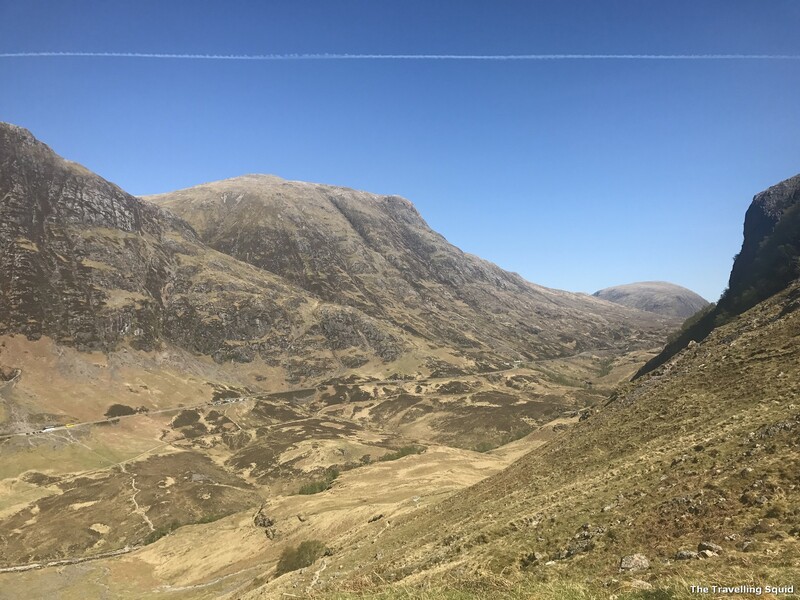 It is a complex mountain, with many ridges and subsidiary peaks, one of which, Stob Coire Sgreamhach, is classified as a separate Munro. The panorama above might help to identify them. 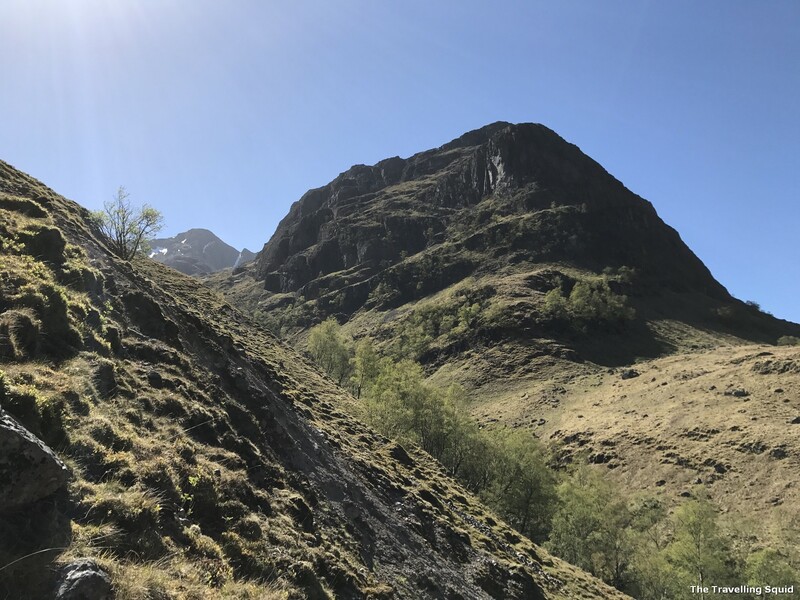 According to Wikipedia, the Three Sisters of Glen Coe, three steeply-sided ridges extend into the North. 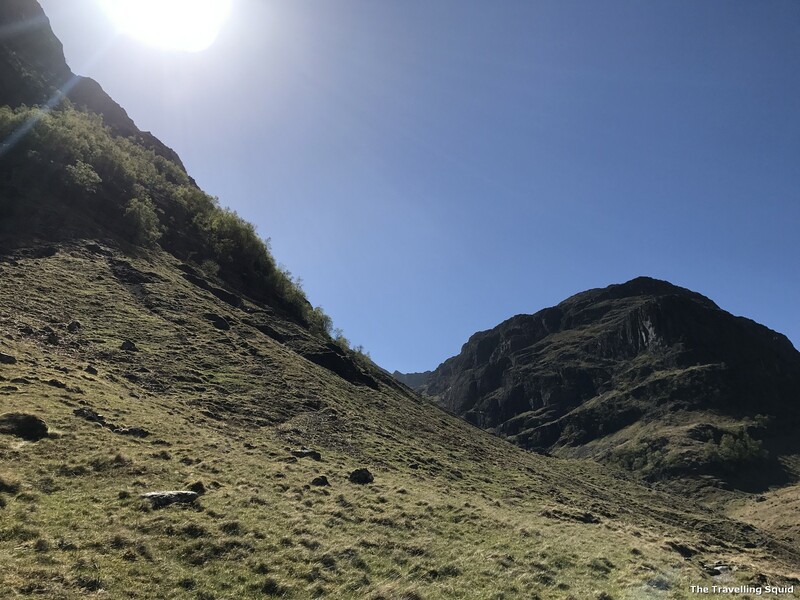 Two of the sisters, Gearr Aonach (Short Ridge) and Aonach Dubh (Black Ridge) converge at Stob Coire nan Lochan, a 1,115 m (3,658 feet) subsidiary peak of Bidean nam Bian that lies about 1 km to the northeast of the actual summit. The final, most easterly sister, Beinn Fhada (Long Hill), joins the Bidean nam Bian massif at the summit of Stob Coire Sgreamhach. 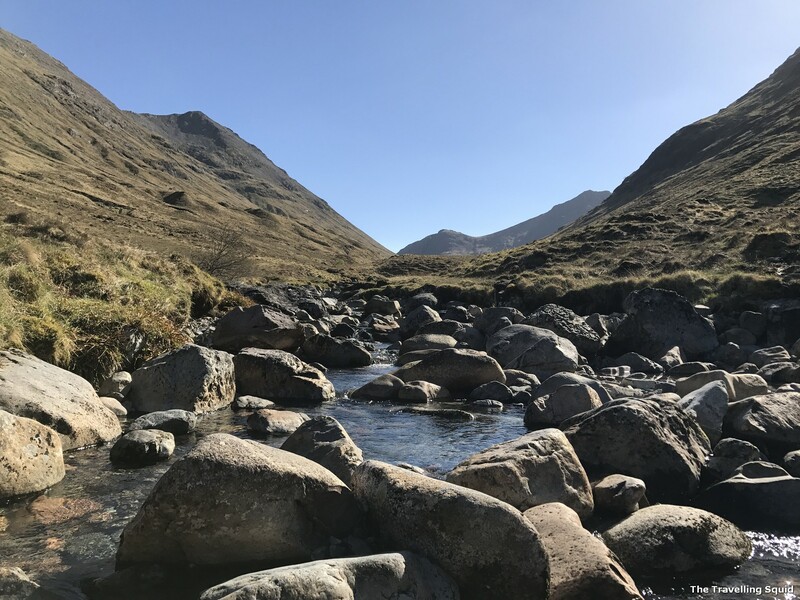 Beinn Fhada is separated from Gearr Aonach by a glen known as Coire Gabhail. 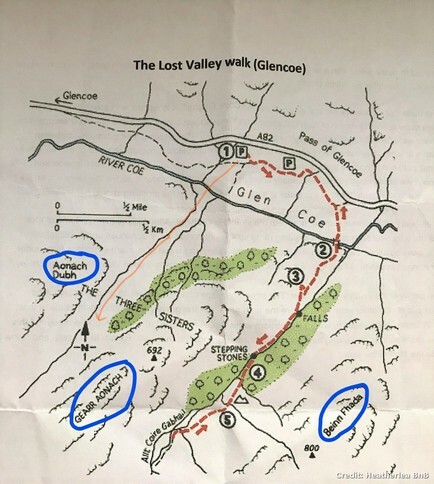 This can translate to Glen of Capture, however the glen is more normally known as the Lost Valley, as it has a wide flat area concealed from Glen Coe by the landslip which blocked the entrance and allowed a loch to form. The valley was used by Clan Macdonald to hide their livestock from raiders, or hide cattle they themselves had stolen. 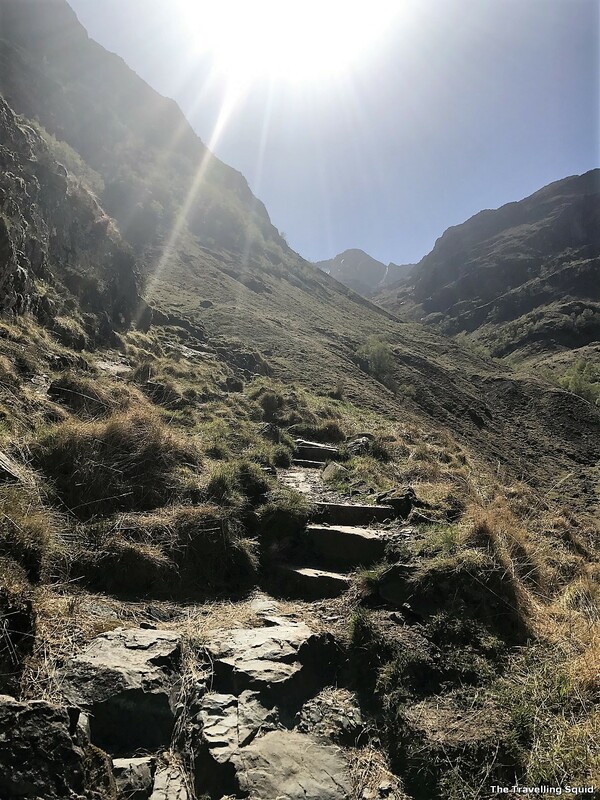 The steep rough path up from Glen Coe skirts a wooded ravine, and is a popular short walk known as The Lost Valley Walk (around 4km). Do note that it involves a river crossing and some rocky sections. The Three Sisters are circled in blue. The path we took is probably the orange line. At this point, I must clarify that this is not an official trail per se. 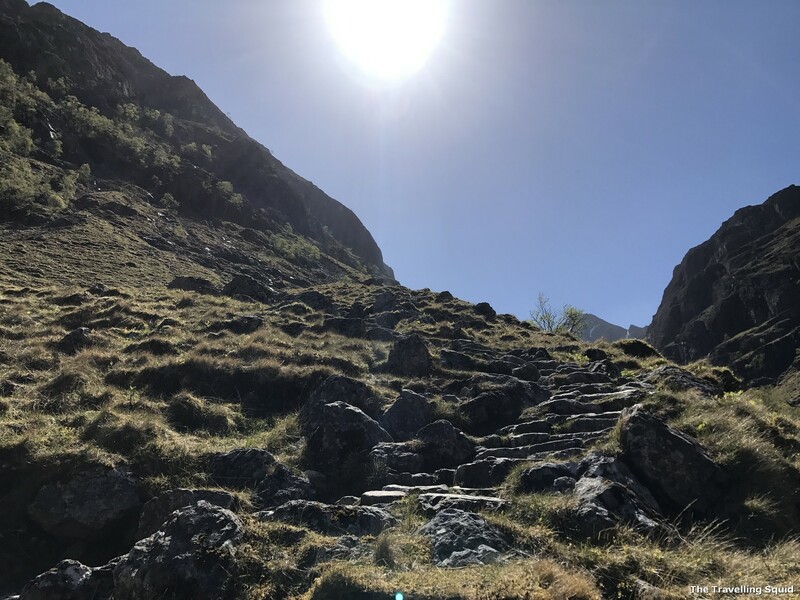 We are pretty inexperienced when it comes to hiking, and followed the path until the point where there was a narrow path near the edge of the mountain which made the crossing difficult. At that point we decided to turn back as S’ boots may not have held up, given its waning grip on the sandy path. The path had a zig-zag form to it but I daresay it was the Zig-Zag path of Gearr Aonach as we did not hike to such a height. Unlike previous posts, this one does not come with directions as all we did was to follow a path. It was a straightforward one. The path at the start is an easy one. The terrain is relatively flat. All you need to do is to mind your step. 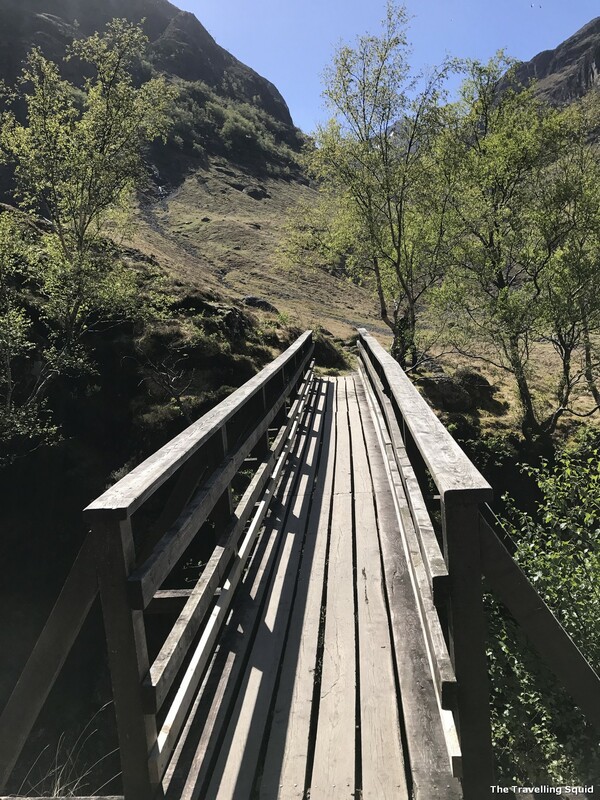 There is a little bridge to help you cross the River Coe (without getting the shoes wet). 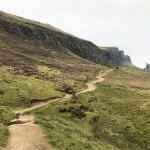 From there, you follow a path and it will lead you up-hill until you come across a little narrow pass around the bend. We turned back there as it was a tad narrow to pass through, with our current footwear. Here are some pictures taken on the trail. The wooden bridge felt a tad wobbly. Along the way, you will see the River Coe. It is possible to go down to the banks. The Sisters loomed ahead of us. The path started getting steeper. I think that was the Aonach Dubh (one of the Three Sisters) peeping at us. The slopes were brownish green while the opposite mountain was bare. What the opposite mountain looked like. The little line you see there is the A82. That was a big boulder which came in really useful. I’ll tell you why in a separate post. The sun was intense, but thankfully, not scorching. You can see the zig-zag from here. That was a perfect moment, when a jet flew by, leaving a straight trail of ‘cloud’ to frame the picture. Thankfully a large part of the trail were covered with stone steps. 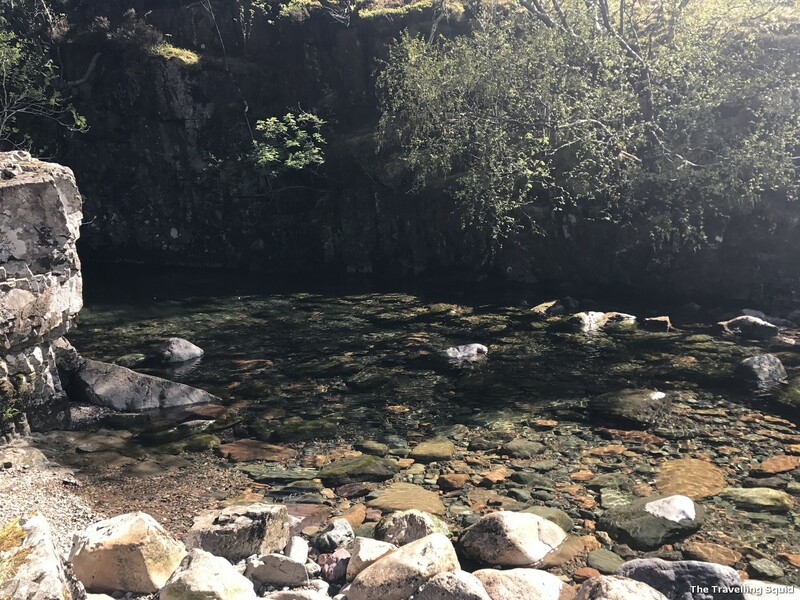 We decided to stop by the banks of the River Coe on our way back to the carpark, just to have a sense of how it was like to come face to face with a Scottish River. It’s easily accessible, you just got to be a tad careful when taking the slope down from the side of the wooden bridge. 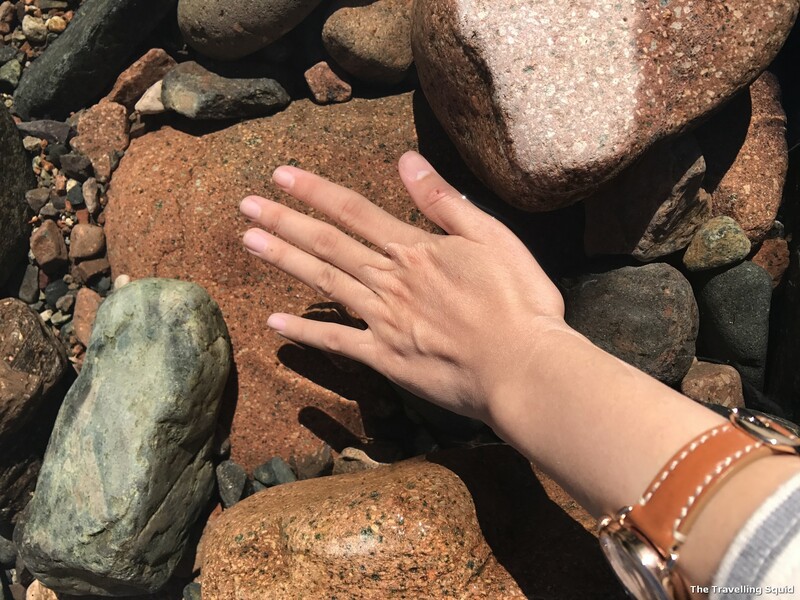 There are footholds which were made by people before us. Heading back up is easy. 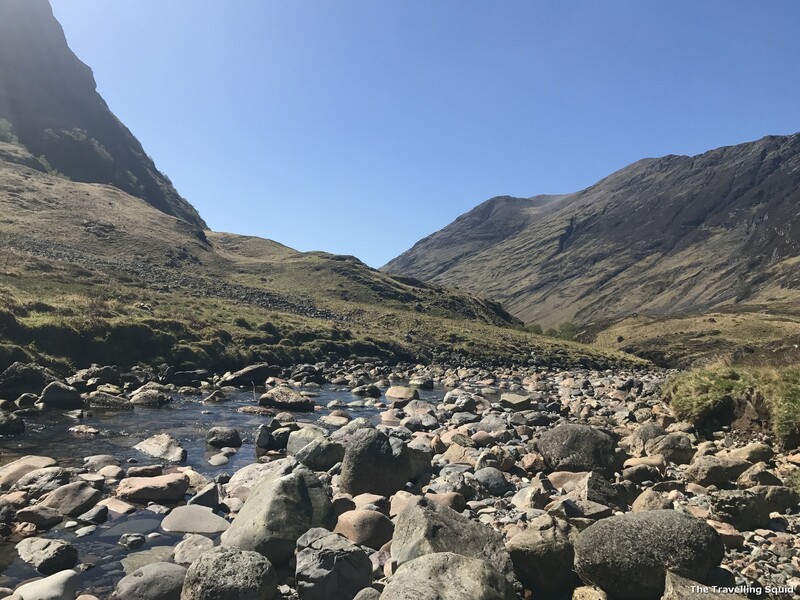 Unlike the streams in a tropical rainforest, the water flowing through River Coe was crystal clear. So pure that I was very much tempted to taste it, but was advised against it as we were at a relatively low point of the river’s journey. It would be better to have a sip upstream, where the flow of the river was stronger as well. Of stony riverbeds and towering mountains. The experience was delightful. It’s not common in South-east Asia to find rivers with water so clear, and cool, against the backdrop of majestic mountains. This is one of my favourite pictures. 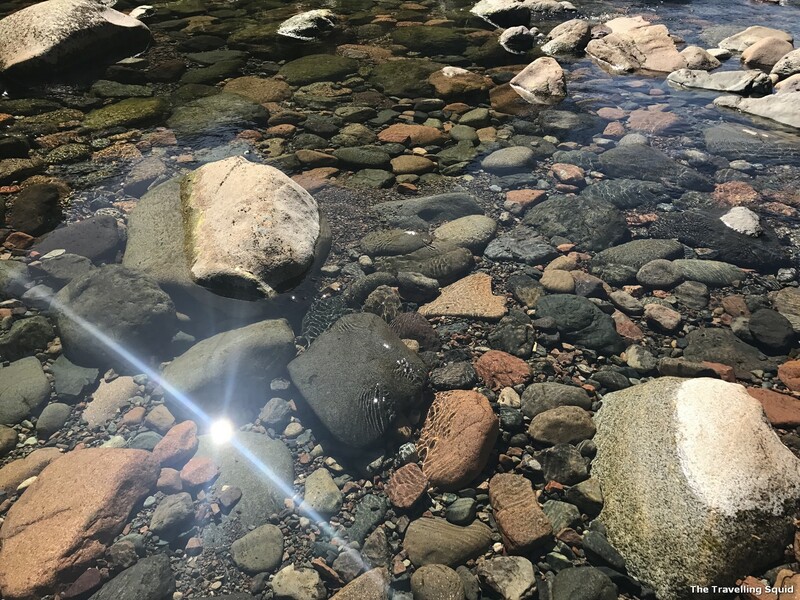 A sparkle in the sun. The water was so clear. I could barely see my hand in it. Apart from the edges of my middle finger. 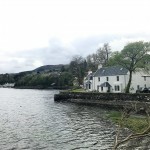 At the banks of the River Coe. 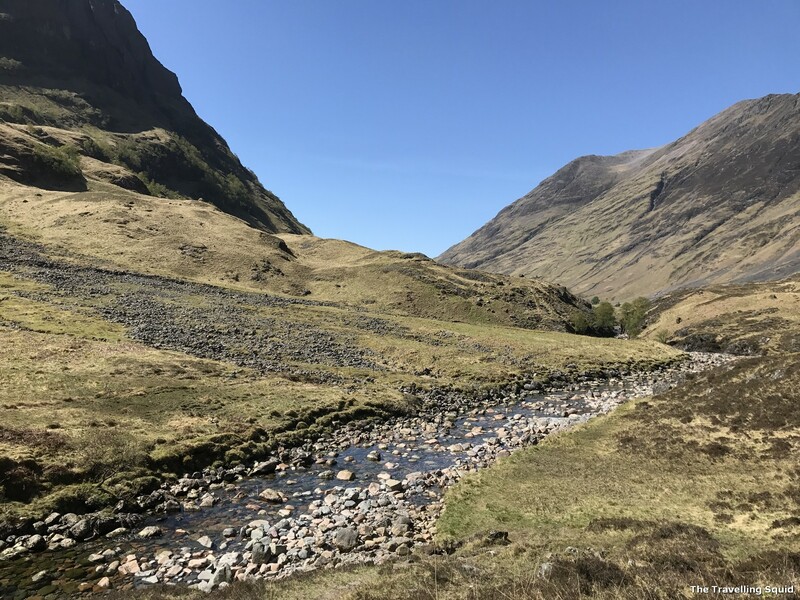 I was happy to have taken the Three Sisters Hiking Trail in Glencoe near Gearr Aonach, despite wanting very much to go on The Lost Valley Walk. I was quite disappointed when we had to turn back from that narrow path, but I suppose safety is paramount. 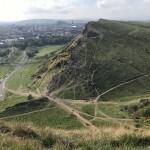 As mentioned in a previous post about the weather, we were lucky that the ground around us was all dry – it helped with hiking up the steep slopes. If you have been on a similar trek before, I’d really appreciate it if you could drop a comment on your experience. 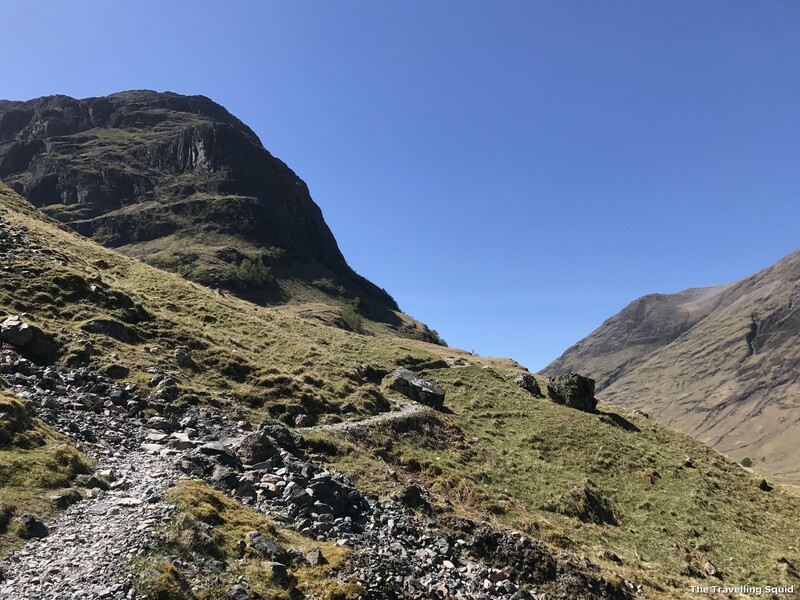 Does this path lead to Stob Coire nan Lochan, which lies between the two sisters, Gearr Aonach and Aonach Dubh? I have a strong feeling it does, and I suppose I would only know if I were to return. 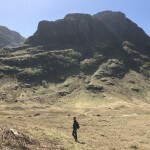 One Response to "A Three Sisters Hiking Trail in Glencoe near Gearr Aonach"